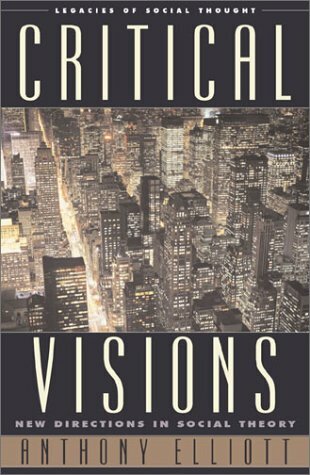 Critical Visions is a collection of essays addressing various aspects and important figures of contemporary social theory. Moving back and forth from Habermas and Giddens to Lacan and Kristeva, the author, Anthony Elliot, considers sexuality, citizenship, politics and ethics as issues central to social theory. The book is divided into two parts, the first one dealing with important interventions in contemporary social theory and the second one dedicated to central issues in today's social theory. In the first five chapters, Elliot discusses the main ideas of six authors: Ulrich Beck, Anthony Giddens, Jacque Lacan, Cornelius Castoriadis, Habermas and Kristeva. These authors are considered the most important figures in contemporary social theory. Whereas in the case of some of them the reason why they have been chosen (Giddens or Habermas) is rather self-evident, for others it seems that the intellectual interests of the author played an important role in selecting them as writers critical for today's debates in social theory. While I agree that psychoanalysis has a great potential for social theory, I am not so sure if another author, one less interested than Elliot in psychoanalysis, would include Lacan and Kristeva in a book on critical visions in social theory. The second part's chapters ('Sexualities: Social Theory and the Crisis of Identity', 'The Reinvention of Citizenship', 'Politics and Social Theory' and 'Social Theory, Morality and Ethics') have several fresh insights which shade a new light on the societal changes as well as theoretical approaches of these changes. The discussion on citizenship ('The Reinvention of Citizenship', Chapter 7), for example, is really interesting. The citizenship based on the nation-state idea, says Elliot, is threatened nowadays by two forces: globalism and localism. The nation–state is not anymore 'the main regulator of sociosystemic order and thus no longer politically accountable for finding solutions to major and traumatic crises (p.152)'. Today citizenship is increasingly seen as an ideology, 'a kind of hangover from the Enlightenment's privileging of rationality and individuality' (p.152). After examining the relationship between personal identity and citizenship, and describing some modern and postmodern strategies of identity, the author summarizes four new paths of citizenship. Individualization of citizenship is one of them because, as Elliot (following Becker) argues, most of the social welfare rights are individual and they 'call upon the individual kindly to constitute himself or herself as an individual. ' (p.159) Another characteristic of the new concept of citizenship is intersubjectivity: 'Citizenship, in this sense, liberates us from the prison house of self-referentiality and becomes a primary social-historical site for explorations in both solidarity and subordination. '(p.160) The increasing flow of immigration and tourists also altered some of the classical dimensions of citizenship. The idea of 'consumerist citizen' is popular nowadays even for governments, 'as the shift from taxation of income to consumption begins to take hold everywhere.' (p.163) As a consequence of all of the above, citizenship has to be comprehended from a global rather than from a national perspective. Although I enjoyed the book, there are a number of things, mainly related to the structure of the book, that seem to need some improvement. Firstly, coherence: despite the efforts of building a certain structure, it is too obvious that the book is in fact a collection of essays, written and conceived for various conferences or other collections of essays. In the Preface the author stresses that he has changed a lot the materials included in order to make the book a compact object, but there are still problems. There are no interconnections between different chapters as ideas from one are not followed up in the following and the structure of each chapter differs from the preceding or the following one. For example, chapters 1, 4, 7 and 9 have a short conclusion, summarizing the main ideas, but none of the others follow this format. Obviously, one might argue that the structure of the book is somehow 'postmodern', with no regularities, and this could be an interesting perspective for reading it. Secondly, there are some inconsistencies between the first and second part. I assumed that the ideas of certain 'central figures' (the object of the first part) must be at the same time, somehow necessarily, 'most important issues' in social theory (second part). Consequently, I expected that, if an author is dealt with in the first part of the book (as a central figure), his/her ideas would be discussed in the second part of the book (as central issues). However, this is not always the case. For example, Beck's ideas, an 'important figure' theorizing about risk and reflexivity as presented in the first part of the book, are not considered as 'central issues' in social theory. As an overall, Critical Visions is a really useful reading for those interested in understanding what is happening with the social theory nowadays. Cristina Bradatan is a Ph.D. candidate within the Department of Sociology, Pennsylvania State University. Her interests include family, psychoanalysis and mathematical demography.